Are you looking for an alternative to the industrial factory farmed chicken that is sold at the supermarket? Even the chicken sold as organic or free-range at the health food store typically comes from CAFO (concentrated animal feeding operations) with minimal time outdoors and little to no fresh green material to eat. The labeling standards are vague and companies are exploiting them to charge you high prices. We decided that us Big Island residents deserve better, so my husband and I have decided to jump right in and do something about it! Our farm will be up and running by mid 2013 and we will specialize in farm fresh pastured broiler chickens. They will be raised in pastured pens that are moved daily so they can enjoy fresh green grass to munch on and a clean environment to lounge in with plenty of clean air and sunshine. Think really big chicken tractors. Our chickens will not be fed any antibiotics. Finally, locally produced pastured chicken will be available on a regular basis! Our chickens will be fresher, more nutritious and tastier than any chicken available in the store. We will do the processing ourselves on the farm with strict sanitary protocol to ensure the highest quality of our product. 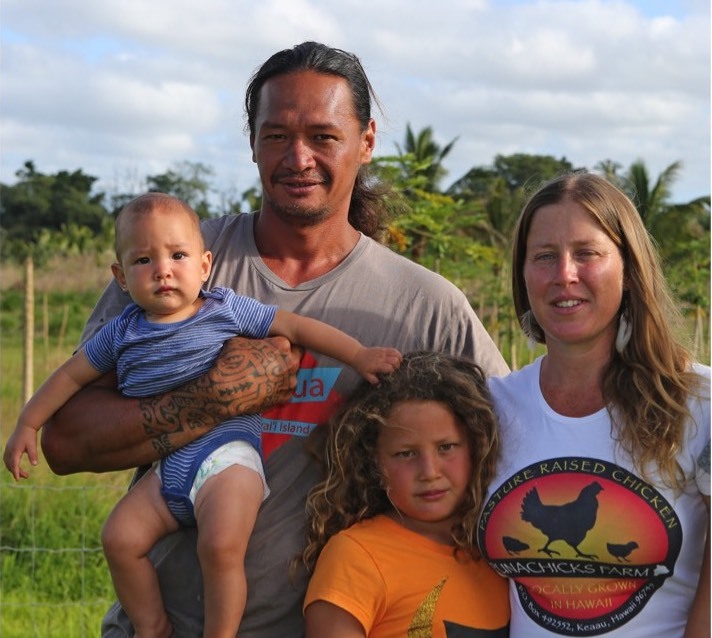 We will be offering whole dressed chickens that can be picked up directly from our farm in Keaau on processing day (probably every other Saturday). Notification of our production schedule will be sent to our customers well in advance so that we can start taking orders. Please contact me if you would be interested in partnering with us and becoming a regular customer when we start production in 2013. I want to reach out to all those people interested supporting the local food movement and ask for your help now to build a solid customer base. And please don't forget to forward on to your friends. Our goal is to build our business to suit your needs. We are committed to promoting a sustainable food system and need your help to make this farm successful!